The World’s forests are shrinking at an alarming and uncontrollable rate. There are of course a wide rage of causes ranging from cleared land for farming and ranching to mining and timber cultivation. Many of these take place within the some times thin and dotted boundaries of local and international law, but there are so many that slip past and go unseen. Thanks to the ever advancing technology of remote sensing these areas of illegal deforestation are slowly emerging out of the fog of corruption and ignorance. Below images show a section of the Amazon forest near Tamshiyacu in Peru being illegally cleared for Palm Oil plantation. Many areas of the Amazon basin are completely cleared each year to make room for Palm, Soya and other plantations destroying entire ecosystems and endangering the survival of many plant and animal species, some of which have not yet been formally discovered. The Palm trees planted are by no means a viable replacement for the natural habitat lost to hundreds of species and after cultivation Soya plantations just expand having depleted all the nutrients in the ground making the land completely useless. There are ways to make the land fertile again after the plantations have moved on but at great costs. 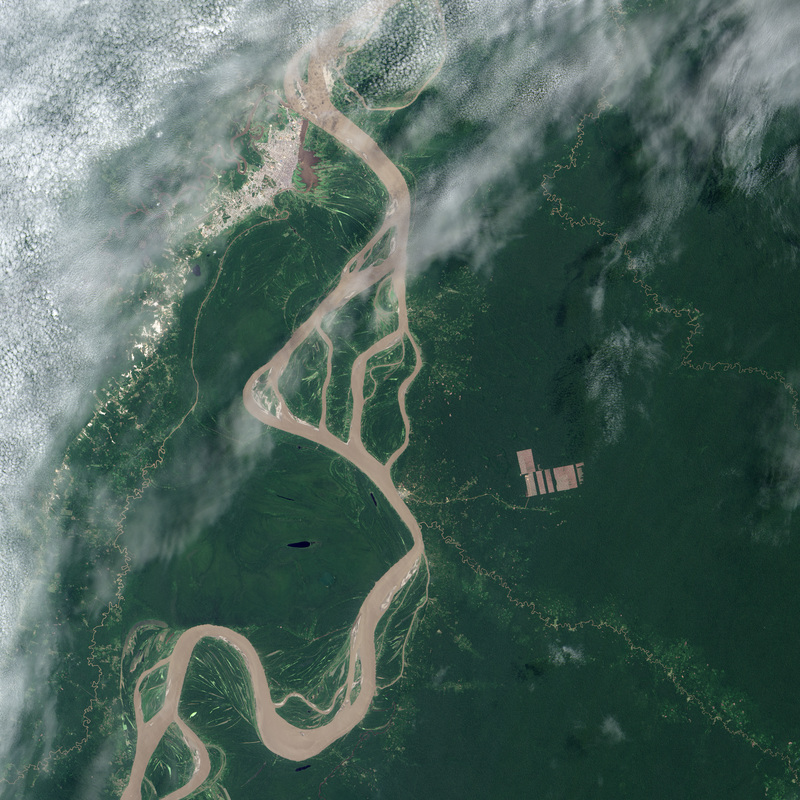 Tamshiyacu Peru showing the Amazon River on the left of the image. Landsat Image acquired October 5, 2012. The same area as above showing the massive deforested area to the right. This area has been cleared to make way for an Oil Palm plantation. 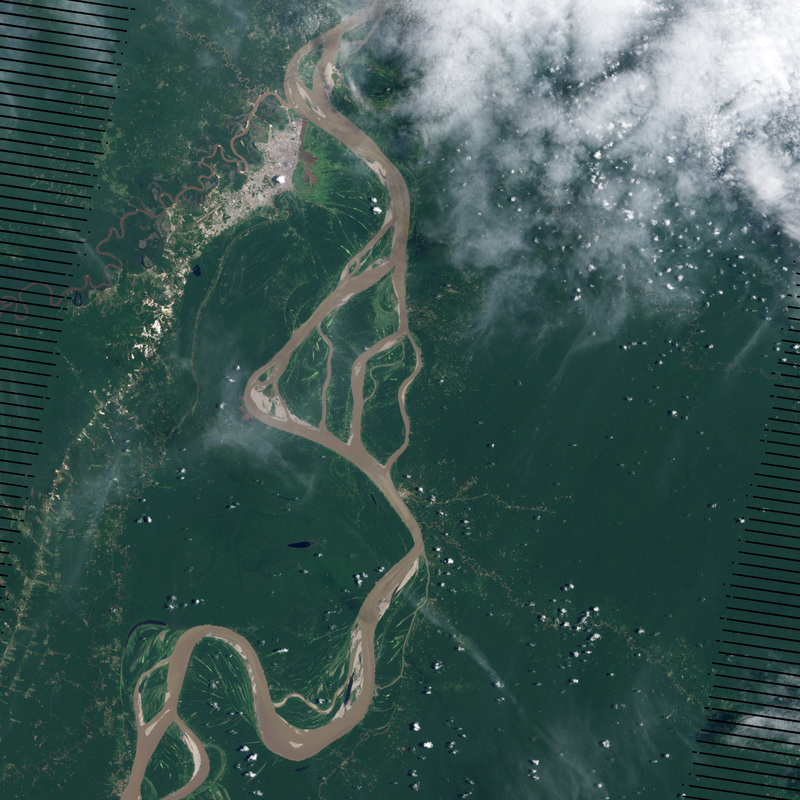 Landsat Image acquired August 28, 2013. The Palm Oil industry has already left a great scar on the face of some of Earths most important and diverse rain-forests in Malaysia and Indonesia. Now the Palm Oil boom has started in Brazil and with carefully controlled sustainable cultivation it can greatly benefit the local industry and people as it should. If planted on the degraded pasture land that is becoming increasingly plentiful, oil palm could generate more jobs and higher incomes for locals than the dominant form of land use in the region: low intensity cattle ranching. Rather than destroying more rain-forest for more cattle pasture, local farmers could go into the oil palm business and benefit from its higher returns. In the end education is key. Teaching the local peoples of affected countries how best to utilize the resources of their lands to prosper and advance, at the same time safe keeping it for future generations. To find out more about Scantherma’s remote sensing services and how it can help your project please go here. When you hear of a satellite being launched what pictures come to mind? Probably something like this. Well that may be so. But never judge a book by its cover, or in this case size. Now the European Space Agency has launched the PROBA-V, the newest in the PROBA series of mini-satellites to monitor Earth’s vegetation. This duty had, for the past 15 years been given to the SPOT-4 and SPOT-5 satellites, both much larger than PROBA-V.
ESA launched this washing machine sized survey satellite on May 6th 2013 along with two other satellites in the same launch vehicle, the VEGA rocket. The first one being Vietnam’s VNREDSat Earth observation mission and the second Estonia’s ESTCube-1 student nano-satellite, to test electric solar sail technology. Proba-V sits on top of the VEGA launch adapter which contains the other two satellites. VNREDSat and ESTCube-1. It’s daily routine consists of orbiting the Earth 14 times and capturing vegetation data with it’s 100m resolution camera. Every 10 days it will output a 200,000 megapixel image of the Earth’s vegetation. As mentioned above this sort of data collection was and is to some degree done by the Vegetation 1 and Vegetation 2 sensors on the SPOT-4 and SPOT-5 satellites. But these sensors will be unavailable. To replace them ESA is developing a new series of satellites called Sentinel under the Copernicus program, previously called GMES (Global Monitoring for Environment and Security). Altogether 5 are being developed and Sentinel 3 will be taking on most of the duties of SPOT-4 and 5, and more. But these satellites will not be ready in time, so in order to breach the gap and have continuous collection of data ESA decided to develop a small satellite mission based on the much successful PROBA design. PROBA-V is designed and developed entirely in Belgium using state of the art technologies and will be “holding the fort” till ESA launches Sentinel 3 next year.